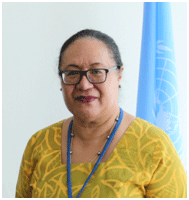 Fekitamoeloa Katoa ‘Utoikamanu is UN High Representative for Least Developed Countries, Landlocked Developing Countries and Small Island Developing States. BONN, Nov 16 2017 (IPS) - Two years ago, 197 parties came together in Paris and agreed to the historical Paris Framework. Since that December 2015, we all have seen countless pictures of utterly devastating floods, wildfires, hurricanes happening more and more frequently all over our planet mainly affecting the poorest among us. The pictures may appear remote to our own lives when we look at them in the safety of our houses on our screens. They are often a mere flash in the evening news. They may give rise to a family discussion, for others they induce anxiety, but none of the pictures can ever fully convey the utter devastation affected families are left with, the suffering of children left orphaned, the despondency of adolescents not seeing a future, the broken elderly person left without hope. Whilst in Bonn this week for COP23, which is scheduled to conclude November 17, I have two words at the forefront of my mind. One is a word from my own culture ‘ talanoa ‘, the Pacific Islands’ word for dialogue. The other word is urgency. This for me is not yet another meeting, yet another travel, yet another series of talks. I grew up as an islander and my child has grown up an islander. The word urgency for us is a word full of action, doing and ‘talanoa’ brings people together to talk. As the representative of the UN Secretary- General for the world’s poorest and most vulnerable 91 countries, which make up more than one billion people on our shared planet, I am in Bonn for the 23rd conference of the parties to the UN Framework Convention on Climate Change. Whilst here I am advocating for the world’s poorest and most challenged countries and above all expecting to get down to the nuts and bolts of taking urgent action. And urgent it is as commitments are already faltering and yet the times have never been more critical for the world’s most vulnerable nations. These 91 diverse countries span our globe, each country faces unique challenges yet all are countries that have one feature in common – they contribute the least to climate change but feel its effects the most. They range from beautiful small islands in remote areas, with fragile ecosystems and rich cultural heritage, to landlocked states in the world’s mountain ranges and countries which span the length of Africa’s deserts, cities and forests. Who has not marvelled at the picture perfect images of the South Seas, the beautiful mountains of the Himalayas, the imposing gold coloured sandy seas of the world’s deserts? It is these countries and their peoples most in need of action , immediate, urgent action. Can we really just continue to marvel on the one hand at the beauty of their nature and then forget how our shared planet’s poorest and most vulnerable increasingly suffer the life-threatening effects of climate change? Are we prepared to leave them behind? We live in times where the short-term, the ‘obvious’ almost appear to be the diktat of action. We live in times where the extremes draw attention. I must though caution you that many of the climate change effects on human lives and our very existence are not always as obvious as they may seem. Yes, extreme weather events make our news headlines. But what about the affects of slow onset events such as sea level rise concerning all of the island nations, the glacial retreats, advancing desertification and biodiversity loss ? These are slow events but affecting the lives and livelihoods of communities. The island nation of Fiji is the COP23 president in Bonn. This is the very first time an island nation has presided over the UN’s annual climate conference. Fiji’s presidency is not merely symbolic but represents a critical juncture in which some of the most vulnerable countries to climate change, the small island developing States, will be centre stage. There is a very simple, existential reason for this. Island countries are well aware that the difference between a 1.5 degrees and 2 degrees goal of warming potentially means the loss of their islands and displacement of their people. It simply means a continued rise in sea levels and more destructive storms. Sea level rises coupled with the warming of oceans means more than just submerging islands, this deeply impacts overall extreme weather event occurrence. Fiji knows first hand what climate change means. Fiji suffered from the destruction of Cyclone Winston in 2016, the most severe cyclone to ever make landfall in the Pacific and which left more than USD1 billion in damages. And yet, progress in achieving the individual pledges which were made towards achieving the Paris Agreement are not on track to halt, let alone reverse climate change. It is highly alarming that the nationally determined contributions by countries currently amount to only a third of the emissions cuts needed by 2030. Our window for reversing greenhouse gas emissions to avoid exceeding the 2 degrees Celsius upper limit which leaders agreed to in Paris is closing rapidly. Studies indicate that we have until 2020, a mere three years, to implement mitigation action to limit greenhouse gas emissions. If we continue as we do right now, we may miss this opportunity to radically reduce global emissions in the next couple of years. This has a very serious bearing on how we go about achieving the UN’s wider 2030 Agenda for Sustainable Development and the Sustainable Development Goals (SDGs). Yet, there also are signs for hope. After all, Paris managed to bring together 197 parties to adopt the Paris Agreement. Importantly, it is the most vulnerable countries themselves working urgently to make a stand. Bhutan, for example, implements an initiative linking climate data with public health for greater resilience to climate change and more advanced warning systems for climate sensitive diseases. Mali, where climate change has led to more and ever more severe droughts, works with women’s cooperatives in agricultural communities to clear plots for food gardens, helping to access clean water and solar power in an effort to ease the social and economic consequences of climate change, which can often also lead to conflict. The time is now to ‘walk the talk’ and be consistent with our noble ambitions commitments is now. We must scale up support to the world’s most vulnerable countries. The world’s poorest will judge us by action. We must practice Talanoa, dialogue. Talanoa is vital as we move forward. All countries, each one of us has a stake in tackling climate change. It is key to close the gap between what countries are currently prepared to do and what is necessary to avoid catastrophic future consequences by lack of action. The cost of inaction will be far higher than ramping up investments in climate mitigation now. For the world’s most vulnerable countries, urgency is not a buzzword but an active state of mind and reality. Real lives and whole countries are at stake. The situation cannot get more urgent than this. Let us together walk the talk.